SDD ITG has developed a unique and novel way of marking and locating medical tubes within a cassette or rack arrangement. This is achieved by implementing an RFID Tag on each tube, which allows for the tracking and location of the medical tube through various processes. The current system allows for up to 100 tubes to be located within a cassette, all within a very short period, typically within 1second. This is achieved through innovative design and novel implementation of this invention. Not only does the system verify how many tubes are present, but identifies each and every individual tube within such clusters. 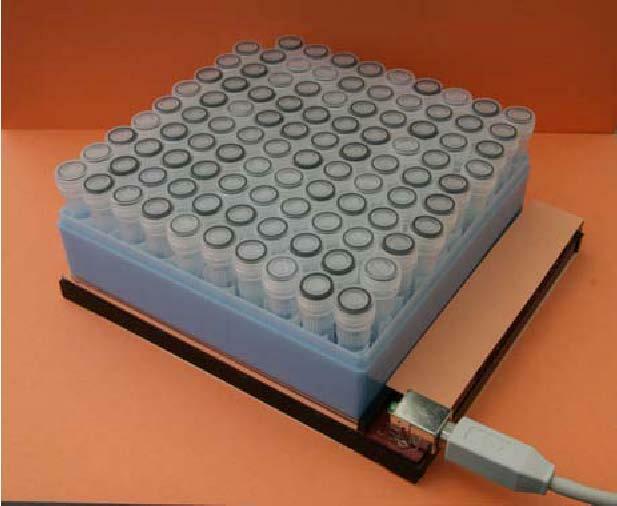 This short identification period, allows for any individual medical tubes to be located within a cluster of 100, within 1second, eliminating potential temperature changes to the larger cluster, but more specifically, allows for very high integrity in locating specific medical tubes, whether holding specific tissue or other variety of medical samples. This allows for mixed tubes to be held in one rack or cassette, with high integrity differentiation. We use ISO15693 compliant technology, as it is appropriate to offer a non-proprietary technology solution to the market space. A special and unique 6mm RFID disc tags, which fits within the base of the medical tube, with the help of a specially designed housing to suit a variety of medical tube types, are used. A suite of RFID Writing Devices are available to write data to the tags, and similarly, a suite of Reading devices are provided to scan and read the tag data at various locations within such deployments. Typically handheld device are used for quick location or singular tube data management, while a matrix of antennae arrays are implemented to scan clusters of tubes, typically when in a cassette / rack. Writing data to the RFID tag on the tube, is done on a desktop device, which holds only one tube at any time. This is to eliminate potential loss of integrity, as it is crucial to make sure that data gathered and/or written to the RFID tag is referenced to the correct tube. Typically the Reading and Writing Devices are USB driven, from a Laptop or PC, so no external power source is required, while the RF Emitting Power is well below permitted standards. There will be no interference with other medical equipment.